This is my new project that I'm getting ready to start. The kit calls it an initial production version but in actuality it's pretty much just a mid/early as it has the external exhaust. The kit has a lot of extras and looks promissing. I will build this as a production vehicle and those external fuel tanks will be promptly discarded. 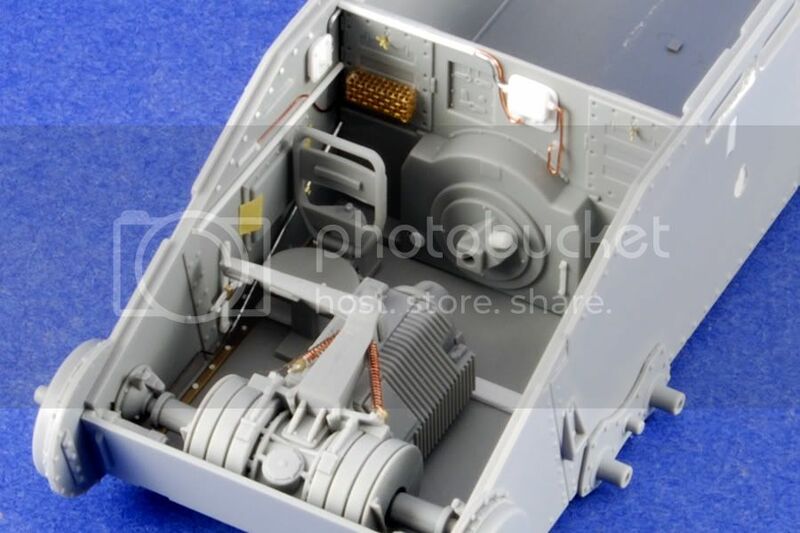 The kit, as is the case with all of these new 38t variant dragon/cyber-hobby kits, has an interior and engine compartment. I do not have all of the parts in yet but they should be arriving over the next couple weeks. I will use the aber set for the tamiya kit, aber barrel, aber fenders, friul tracks and tamiya brass shells and maybe a few additional odds and ends. It's a small kit so I want to really try to do it up right. I do need some input from you guys while in the waiting stages. 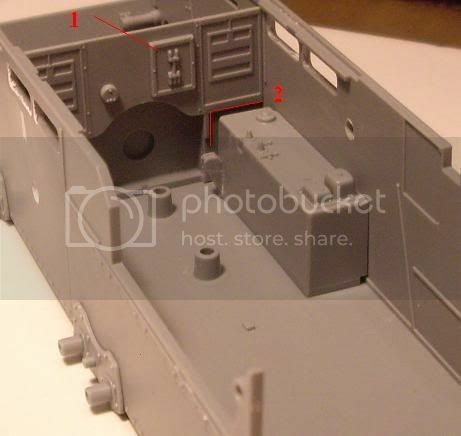 I have ample references for the exterior and fighting compartment from various surviving vehicles but the engine and driver's compartment are proving to be elusive. 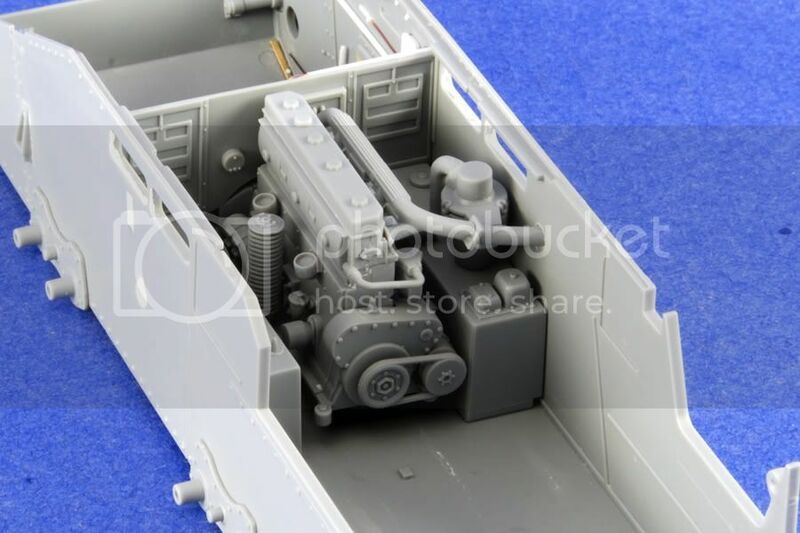 I do have in mind to leave the transmission cover, front hatch and engine bay open so I would like to add some extra details that are not in the kit (engine plumbing, electrical, etc.). 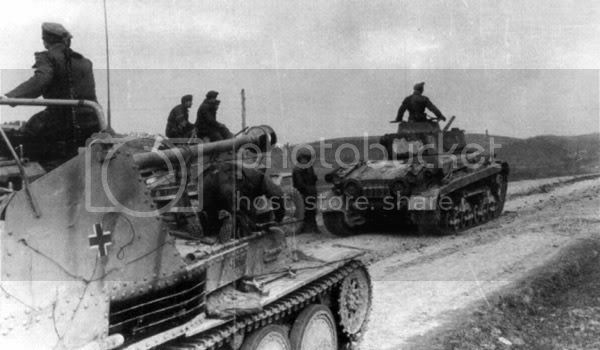 That being said, I have not found any really good references for the interior of this thing other than interior pics of the 38t tank. 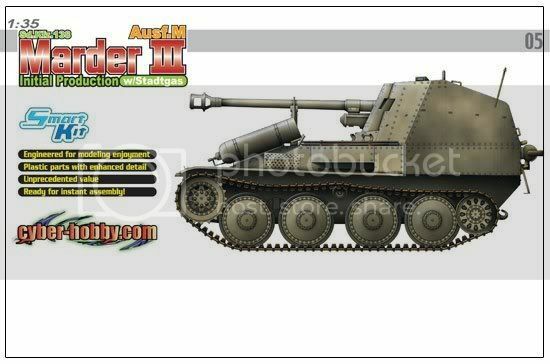 If anyone has advice for interior and engine pics for a Marder III M I'd appreciate it. If I can't find anything, I'll just try to match the pics that I do have and hope it's close. Most of it will not be visible anyway so it's not that big of a deal, I just want to spruce it up a bit. In any event, I'll post some pics of all the goods when everything is in and accounted for and we'll be underway. If anyone has already built this kit, I'd love to hear your opinions and any problems you may have encountered. I plan to finish this with a small base and maybe a fig or two. In the interim, I Picked up the Osprey book by Sam Dwyer for inspiration while I wait (interesting read). Well, I'm starting in on this one. Still just unwrapping and doing some clean up on some parts here and there but no glue yet. I have a question that I think I know the answer to but wanted to ask you guys anyway. The drive sprockets and idlers are provided in both types. The sprockets with and without holes and the idlers with holds and tear-drops. Now my understanding on this is that the initial production vehicles had the tear drops in the idlers and holes in the sprockets and most of the mid and late production vehicles had the solid sprockets and regular idlers. Thus, for a mid production vehicle you could see either configuration. Anyone have any thoughts on that they could share? Note: for mid production, I am referring to the rivetted hull and cast driver's hood but external exhaust. I've come to somewhat of a decision regarding the sprocket and idler comments above. I posted the same question over at ML and noone seems to have any info on it as of yet. As many of you already know, the cyber-hobby/dragon early 38t sprocket wheels are not the greatest. The weight saving holes appear oversized to me and the ones that came with the friul tracks are warped pretty badly. I may change my mind, but I think I'm going with the mid/later stype sprockets and idlers. 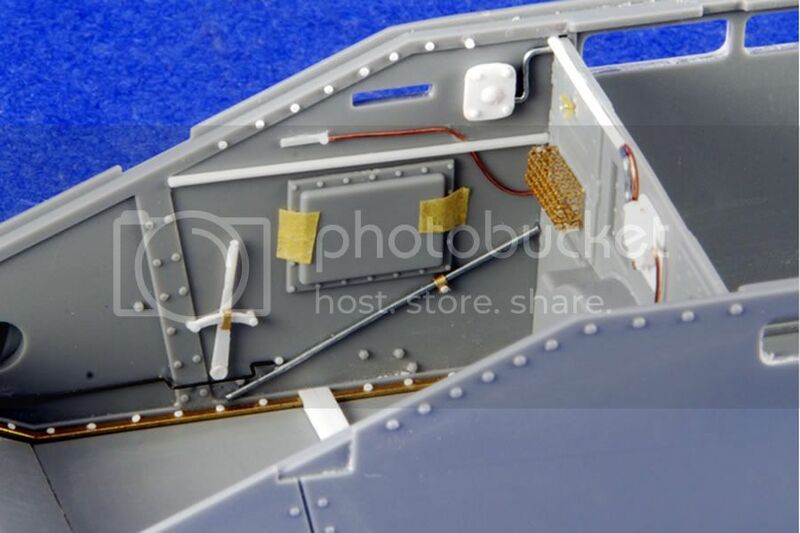 The attached pic shows this configuration with the rivets on the side of the upper hull clearly visible to confirm my assertion that the early/mid III M's could have either. I'm still a way away from gluing any parts together so again, if anyone has any information on the sprockets and idlers I'd still like to hear it. I've started working on the interior since I still don't have a few of the aftermarket items I ordered. I have run in to a couple of issues that hopefully some of you that have built this or maybe another of the 38t's may have encountered. First of all, the fuel tanks seem to be too tall. The air filter touches the tank when installed and there is a groove cut into the firewall/bulkhead where the tanks should go but they are too tall to fit. Maybe that's how it's designed to go together but it seems strange. Also, the engine touches the firewall/bulkhead when installed and actually pushes up against and bends it. On top of that, when the engine and transmission are installed, everything seems like it's binding because it's too tight. None of this is too big of a problem, I'll just have to exercise a bit of re-engineering. I'll get some pics up when the progress warrants it but besides the above issues, the detail is really nice. This is my first cyber-hobby kit and I must say that I'm impressed. There is one other thing I forgot to mention. The firewall isn't tall enough to reach the roof plate. I assume it's supposed to? As it is there is a noticeable gap between the firewall and the top armor plate when dry fitted. Chad! Is that a Turan there on the pic? or what vehicle is it? Still a bit confused on the engine compartment and why the stuff doesn't fit right so I thought I start in on the driver's compartment. The transmission is pretty nice as is and not much of it can be seen after assembly but I added a few bits. The final pieces can't be added until it's installed as it's a bit of a tight fit and I have to let the end pieces flex to get it to go between the hull sides. The visible gap you see in the pics is not really there as I used CA to fill it. As for the rest of the compartment, I just added a few things that I thought might could be seen through the hatches. I can't really find any really good references for this so most of this is a mix of what references I do have along with images of what others have done with scratch details and the CMK and trumpeter interiors. Again, the kit is pretty good and a lot of this can't be seen but I thought the interior wall next to the driver really needed something to dress it up. Please feel free to point out any errors I've made as again, I'm working from very limited references on this part of the model. If something shouldn't be where I've put it or if something is missing alltogether, feel free to chime in. I know some of the more minute details have been omitted but very little if any of this will be visible anyway. The basic engine assembly is finished but I havn't plumbed any of it yet as again, references are a bit skimpy. I'll get rolling on that soon but I need to formulate my strategy first. However, as you can see, the kit once again provides a very nice starting point. I do have a few references for the side of the enging with the intake so I think I'll be ok to detail it up a bit. Not bad progress thus far but still a long way to go before I can think about painting the interior. I still havn't gotten in my aber update set so Havn't put in the driver's visor or the transmission access hatch. Started on scratching the driver's hatch cushions earlier today but that's going to take some work. Once all of that is done it's on to the engine bay. Looks great so far. 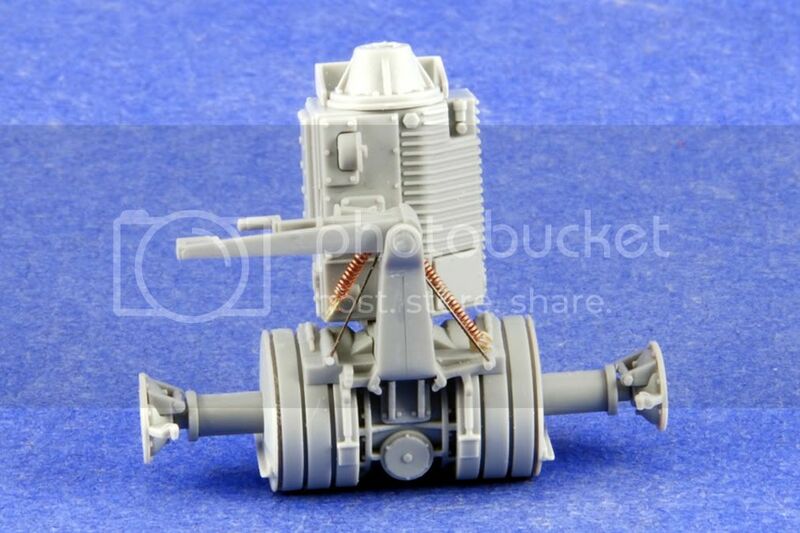 That engone is very detailed for kit pieces. 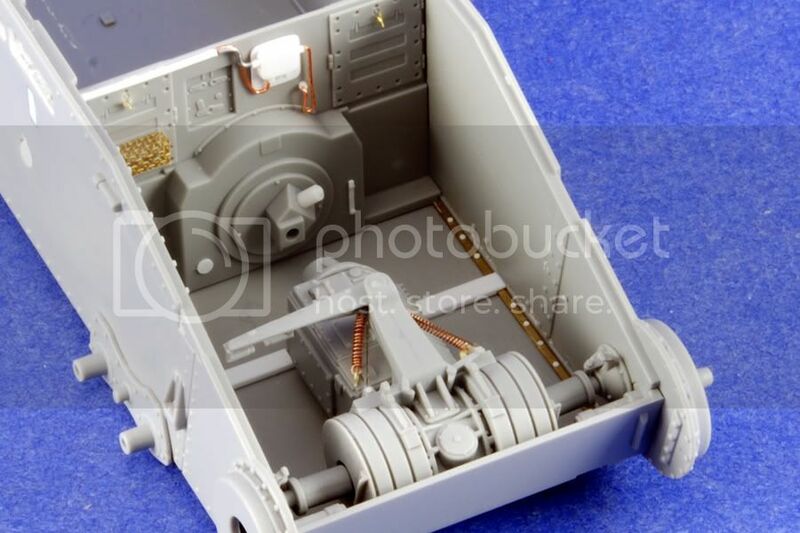 anybody got a pic of the inside of the driver's hatches on one of these things? I know I've seen these detailed by someone online somewhere and now I can't find the pics.